MIPS — one of the Quality Payment Program tracks for the Medicare Access and CHIP Reauthorization Act of 2015 (MACRA) — is designed to help practices move toward value-based payment models. Clinical Practice Improvement Activities (CPIA). How does the Centers for Medicare and Medicaid Services (CMS) calculate your MIPS score, and how can you tell if you’re doing what you need to get paid? 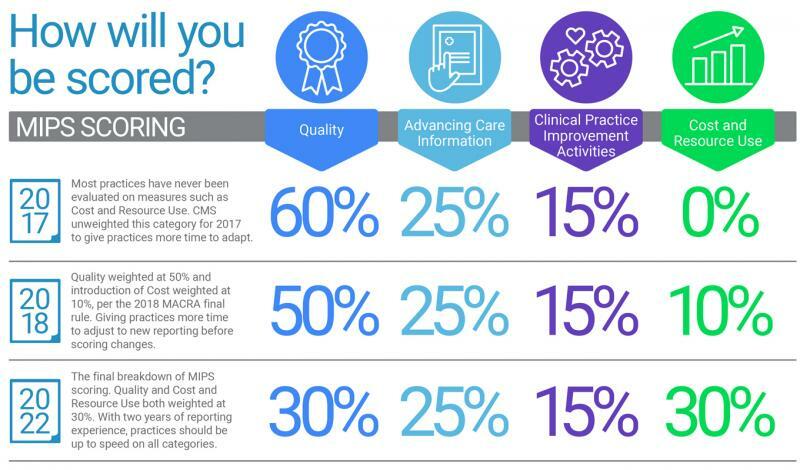 Our valuable infographic details the four MIPS scoring categories, how they are weighted this year, and what you can expect next year as CMS brings the program up to speed. Click below to see how you can get the best MIPS score in 2018 and beyond. Through services such as practice management, EHR, analytics tools, and Greenway Revenue Services, Greenway Health provides a complete ambulatory solution designed to help practices focus on their mission of providing quality care.